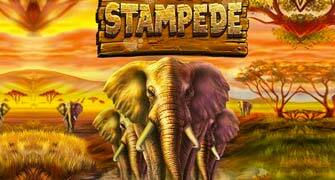 Stampede is another in the of games made by Betsoft. This is a very popular game-development studio that has made many games to date. So, is there something special about Stampede, in particular? Should you give this game a try? Well, we believe that you should and we’ll give you the reasons as to why we think so. So, below you will get to read about the most important characteristics of this game. The way this game plays out is as to be expected. If you have played one slot – then you have played them all. And Stampede is no exception to this rule. To that end, you will need to select your bet and start spinning the reels. And it’s that simple. There are some deviations from the standard formula, though. For one, there are 1024 ways to win in this game. Moreover, you can take an additional risk after making a win. You can double up your wins or lose them – at the flip of a coin. Use this feature very carefully. You can select the autoplay feature and get the game to play itself out for you. And that’s really all there is to the basics of the game. Of course, you will need to make winning combinations of symbols on the pay reels. And what these symbols are varies from game to game. To that end, you can play with elephants, giraffes, zebras, leopards, and other symbols. There are some special symbols that you can use, too. The scatter symbol can bring you up to 20 free spins – if you get multiple scatters on the reels. If you get a wild symbol, then you’re in luck. This symbol can replace all the other symbols of the game except the specials. 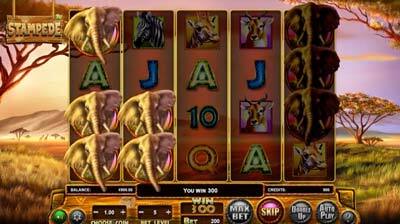 The theme is the natural habitat of the exotic animals of the game. As you have read before – there are giraffes, elephants, zebras, and the like. To this end, the game features a beautiful atmosphere that’s rarely to be found in slots. We think that it’s highly enjoyable. There is a serene music in the background at all times that serves to enrich the atmosphere. And also, if you spin the reels the music will get more dramatic. You will feel like you’re in a real jungle. So, we suggest you try playing Stampede and see what it’s like. At CasinoViking, we’re confident that you will end up liking it.